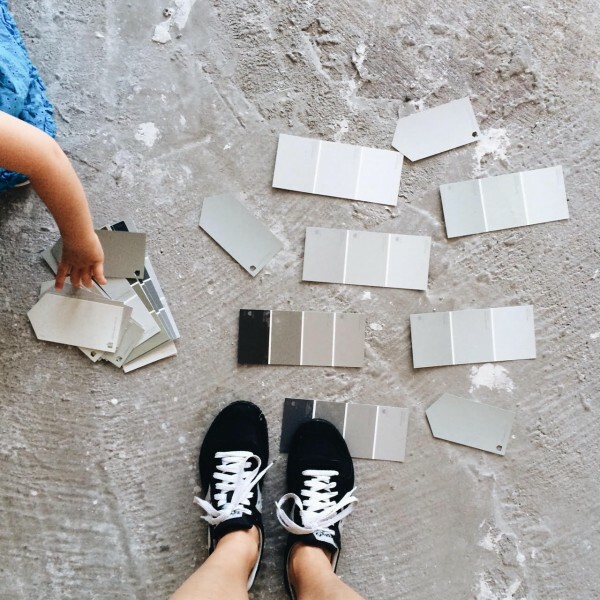 Last week Mabrey helped me choose a paint color for the studio floor. Don’t get me wrong. I love concrete floors but these are badly stained, cracked, crumbling, etc. If paying someone to fix and polish them didn’t cost an arm and a leg, I would totally do it. But, alas, it seems the going rate for finished concrete floors is one arm plus one leg. So a few gallons of porch and floor paint it is! I literally threw a bunch of swatches on the ground then we walked all over them. I picked the one that showed our dirty footprints the least. I also finished rehabbing a pair of vintage dressers for a client. Fancy new dressers weren’t in the budget so I found a matching midcentury pair via craigslist for $45. The tops were fugly laminate and I used Ardex feather finish to give them a new look. I’ll be sharing the tutorial and before-and-afters later this week. It was a really fun project. *Real estate finds: I want to show it some love. I want to save it. *I have two new instagram crushes: Gray Benko and Insieme House. One makes me laugh and the other makes me want to buy a teeny A-frame ASAP. *I just finished reading this book and now Steve is reading it. The tiny house lifestyle really appeals to me. I’ve all but decided that when we’re empty nesters we’ll have a tiny house. Steve says okay as long as he gets a big workshop. *Steve has been dropping hints as to what he wants for Father’s Day. It’s either a food processor or a BBQ Dragon. If you go with a food processor for a Father’s Day gift, get the 12-cup Cuisinart. Just trust me on this one – the 7 cup has a liquid capacity well under 7 cups and if you’re using it to make larger amounts of things, you’ll have to do it in batches. It’s easy to use the 12-cup for smaller amounts, but you can’t use the 7-cup for larger recipes as well. I love my Cuisinart food processor so much it’s kind of embarrassing, but it works beautifully and is so much quieter than the cheap 7-cup model it replaced. Absolutely LOVE Astrids home. Shes such a sweetheart and youre right, her Aframe is rediculously inspiring. I had her over on the blog sharing all about her life her tiny house recently. You should check it out…. Oh Shavonda, I love your interview! I hadn’t read it yet (can’t keep up on my blog reading) so thanks for the link. I am so inspired by people who live small. And Astrid proves that living small can be stylish. 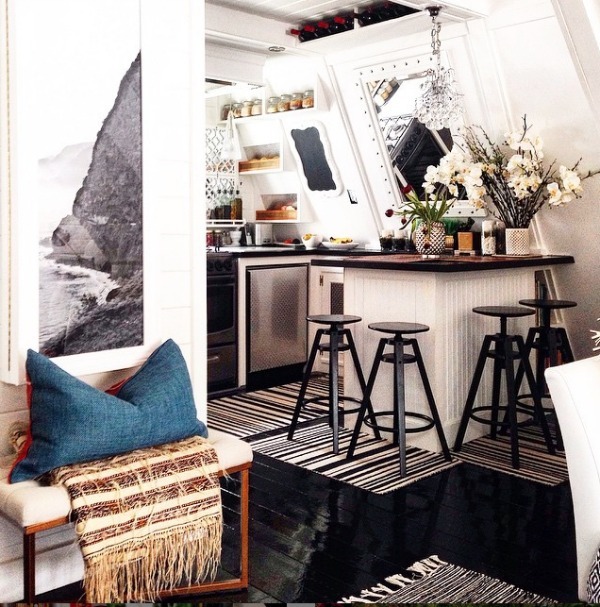 I’m a sucker for all the nooks and crannies (those built-ins!) and the angled walls / ceilings. Omg no worries love. I know how crazy the last couple months have been for you friend. Isnt her home amazing. I seriously love it. And youre right, its all about the nooks and crannies. Thats why i adore old houses so much. They tend to have massive nook and cranny awesomness going on. I love small space living so much now that we are in our little house. I could totally go smaller, but Im not so sure about Naomi. Shes ok in our house, but her biggest (and only really) complaint is sharing a bathroom with the kids. We need a second bathroom like yesterday. And a true master bedroom. We hopefully be breaking ground on the addition by the end of the year. We are looking to do something very similar to what Sarah over at Smitten Studio. She only added on just under 200 sqft for her master bed and bath addition and I love that. Its important for me to keep the cottage bungalow feel of the house so i dont want to add on too much space. We are at 1200 sqft right now and when its all said and done i want to keep up at or under around 15-1600 sq ft.
LOVE Sarah’s addition. It feels to scale with the original footprint and was just enough to get what they needed. I, too, think I could live smaller but Steve isn’t so sure. I think it’s all in the design though. A thoughtfully designed space lives so much bigger than its square footage! i always love these posts – seeing what other people find online and what they enjoy! i am clicking on every. single. link! i’m also a huge fan of the tiny house movement – one day….ONE DAY! I know. Had I known what I know now, I think I would have built a tiny house right out of college! I’m swooning over those mid-century knobs! Beautiful! Oh I am so excited for your tutorial! I also have an MCM dresser with a fugly laminate top, which I’ve been putting off refinishing for a couple of years now just because I didn’t know what to do with it. 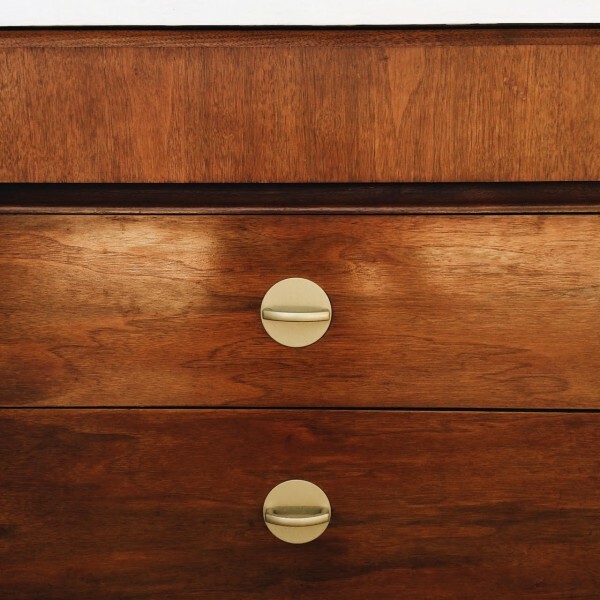 On top of that, I’ve been itching to try Ardex somehwere but it never occurred to me that my dresser could be a perfect candidate. You are just brilliant. Can’t wait to see it! Hi. So enjoy your posts. Have you ever considered ARDEX for kitchen counter tops? I haven’t but that’s just because I didn’t know about it when we had laminate in previous homes. It sounds like a good stopgap measure (super affordable!) while saving for what you really want. The only issues I’ve heard with using it in a kitchen are that oil drops tend to stain…even after the Ardex has been sealed. I have a friend who is currently flipping a house and she’s thinking of using Ardex to cover the laminate countertops in the bathrooms. I hope she does so I can check them out! that second house on the real estate links? literal PERFECTION. would not change a THING. hot damn that place is amazing.